Do you write amazing business blog articles? Do you need more people to read them? If you’re a B2B, LinkedIn is the ideal place for you to connect with your market, develop relationships, and drive traffic back to your blog. With over 433 million users worldwide LinkedIn is the go-to social site for business networking. Here are 10 ways to increase your LinkedIn ROI and get more traffic to your blog. Your LinkedIn Profile is your first impression on the site. Make it a good one. Create a branded company profile. Make your company page personal, professional, and memorable. One of the best ways to do this is through your banner image - keep it branded, but personalized. Include your logo for brand recognition on the site, and to further develop trust with your market. Tell a brief story about your company’s history in your “about” section. Complete your personal profile. As a content marketer, blogger, small business owner, sales manager, or CEO, you are the one who’s likely going to be using LinkedIn to network. People are people, and we relate better to an actual person than to a business. Complete your personal profile, with a personalize yet professional summary. Upload a professional, yet friendly headshot. Include a link to your blog, as well as to your website in both your company and your personal profile. 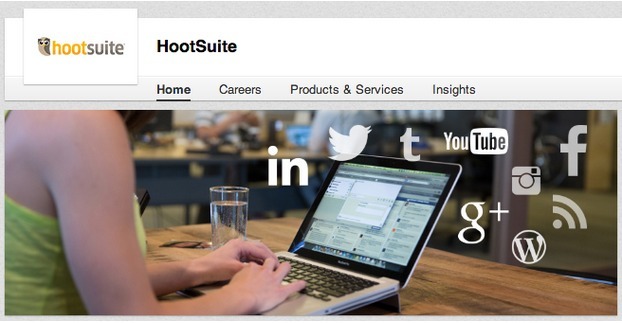 HootSuite’s company profile on LinkedIn is personal, professional and memorable. They include their logo image - which will be shown in updates. Their banner image is both welcoming, and functional - as it clearly shows a customer using their social media management tool. Make a welcoming, trust-building business profile that succinctly tells who you are. Make a completed personal profile, with a friendly, professional headshot. Include a link to your blog and website in both your business and personal profile. Search for people you know on LinkedIn. I kind of think of LinkedIn as my modern day ‘rolodex’. The site is an amazing way to keep in touch with all of your business contacts, and to develop your network. The more connections you have, the more people will see your LinkedIn status updates. 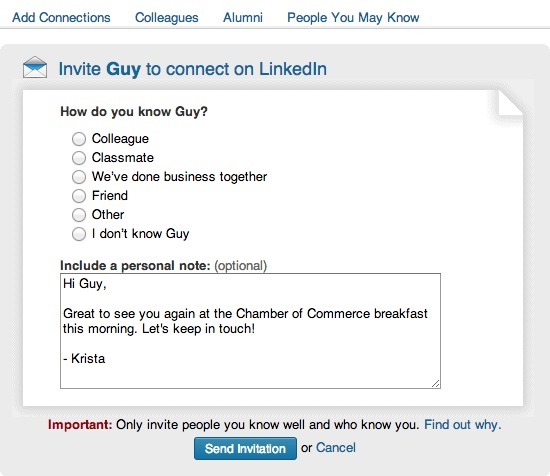 Use a personalized LinkedIn note when you’re building your network. Search and connect with co-workers, business partners, alum, email contacts, customers and social media followers on LinkedIn. Use LinkedIn like a rolodex - when you network with someone in person, connect with them on LinkedIn. If you want to drive traffic to your blog from LinkedIn, then you need to be active, and post frequently on the site. Post status updates a few times a week. This ensures that your friendly face and/or company logo is seen often by your business network. The more you’re seen by your connections, the more trust you build, and the more likely they will click through to your blog. Additionally, this trust can develop into potential clients or partners. Don’t spam your network. Use your judgement (or analytics) to determine how many times a week you should be posting. Post article links to your blog. Use LinkedIn to nurture relationships further, by inviting your contacts to connect with on your business blog too. Post links to other articles. If you don’t have two or three articles in a week to post, post links to other articles too. For example, post articles about news in your industry, or from well known industry leaders. Well known social media blogger, Brian Honigman posts his own articles, and links to others too, such as with breaking news updates. He includes a personal intro in his updates. Make status updates a few times a week, to build trust and increase your click through rate (CTR). Create a calendar reminder to stick to a schedule. Post links directly to your blog, and to other people’s content. One of the key features on LinkedIn are groups. There are over 1.5 million groups on LinkedIn, and 81% of LinkedIn users belong to at least one of them. There are groups from the Abu Dhabi Business Network to the ZwembadBranche, and everything in between. You’re sure to find your niche networks with whom you can share your blog articles. To find groups on LinkedIn, click on your “Interests” tab, and then “Groups” in the drop down menu. Search for topics. 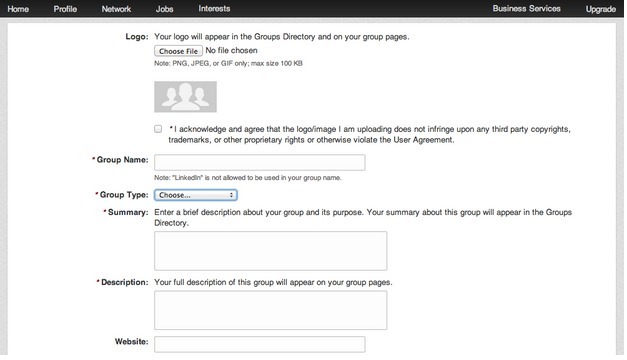 LinkedIn will also offer you suggested groups based on your current activities, profiles and so on. When you find groups you’re interested in, check them out first. Assess whether they will be a good fit for your business. Check out the guidelines. Check out the number of members, and activity within the groups. If it is an open group, you can check out the types of posts and if it fits with your target market. Join groups that have genuine engagement. The Retail Industry Professionals Group is a closed group (you have to apply to join), with over 300,000 members. They discuss all things related to the retail space. There are over 1.5 million LinkedIn groups, many of which offer incredible networking opportunities. Search for groups, and assess which ones would be of value for your business. Join groups that have genuine engagement, and reach your niche. If you can’t find a group you like, make your own. If you really aren’t finding your niche, or you want a specific group for your customers or business partners, make your own. Note: If you go this route, you’ll have to spread the word about your group. To reduce spam on your group, and make it truly a place for networking and discussions, you’ll also want to have clear guidelines for members on what to post, and what you’ll remove. You’ll need to moderate the group, too. So, be prepared to make this time. Check out more tips on managing a LinkedIn Group. Your business can benefit by starting your own group. You can increase trust and develop the reputation as an industry leader by providing a space where your like-minded niche can exchanges ideas, tips and connections. If you want a specific networking group, create your own. Make a theme for your group, create guidelines, and invite participants. With your own group, you can be seen as an industry leader in your niche. Just like on any social network - and, well in person too - the more engaging you are, the more of a relationship you can build with your connections. When you post article links, include a question, a statistic, or a personal view. Give people a reason to comment, like or share your article. When someone comments on your update, be sure to acknowledge it. Comment back to keep the conversation going , and build your networking relationships. LinkedIn gives you tools to make a poll , too. Use this function to engage your connections, and your group members. Make a poll to generate interest in one of your articles, for example, by asking a trivia question that is answered in your blog post. Engage in your groups , too. The more engagement you have in a group, the more likely you’ll become a top influencer. When you’re a top group influencer, more people will read your posts. When you post your blog content on LinkedIn, ask questions about it, and respond to any comments from your network. Networking on LinkedIn is like networking offline too - be conversational and engaging by asking questions and responding to comments. Use LinkedIn tools like polls to create interactive content about your blog. Engage in your groups to become a top influencer. Of course, to drive traffic to your blog, you need to be creating articles that appeal to your LinkedIn market. Make interesting content on your blog. Stick with a business theme for your articles, that supports your business goals, and that relate to your target market. Make engaging content on your blog. Host contests and sweepstakes, for example, to generate motivation to click through to your site. If you are a B2B company, run a sweepstakes to give away one of your services for free. Post it to LinkedIn. Many LinkedIn Groups have a “Promotions” section, where businesses can share deals, discounts and giveaways. The group, Digital Marketing, has a tab for “Promotions”. Businesses, such as Tradeshow 365, post information and links about their deals to share with other group members. Keep your readership interested by consistently writing within your business theme. Create attention-grabbing headlines and images, that intrigue your target market to read more. Host interactive content like contests and sweepstakes on your blog. You can send LinkedIn emails directly to your connections. Use this to send pertinent blog articles to individuals you are connected to. For example, when you are hosting a sweepstakes on your blog, send a message to your network to spread the word. Just as in any email marketing campaign, make your message personal. Mention your recipient’s name, and give them a reason to feel special about clicking through to your blog article. Segment your email, too. If you have a list of clients and a list of partners, make specific emails to target each group. Now, you’re not able to create nice HTML formatted newsletters with your blog articles, but you can use LinkedIn emails to send out periodic updates to your connections. Warning: Don’t want to overuse this feature by spamming your network. Share your blog articles through LinkedIn emails, with personal and segmented messages. Use LinkedIn email to communicate directly your connections - when you have important and relevant articles to share. Don’t overuse or spam LinkedIn email - you’ll lose trust and brand reputation. LinkedIn Influencers was implemented earlier this year. It gives you a chance to find, follow and learn from top influencers in your industry. Top Influencers include the likes of Richard Branson, Jack Welch, Barack Obama, and Arianna Huffington. So how can you use Influencers drive traffic to your blog? Create a list of Influencers to follow. Share their articles with your connections. While this doesn’t give you direct hits to your blog, it does show you as an industry leader to your followers. This builds your reputation by association, and develops trust within your networks, which will then drive more traffic to your blog. Comment on Influencers’ articles. Develop your network by commenting intelligently on Influencers’ articles. They are some of the most read articles on LinkedIn, so get more visibility for your business by engaging on them. Let’s say you’re in the social media marketing industry. You could follow Guy Kawasaki. When you read one of his articles that connects with your business, engage in his community by posting a thoughtful comment. Follow LinkedIn Influencers to find great articles to share with your LinkedIn network. Comment on Influencer articles to engage on their communities. Get great ideas for your own future blog posts too! 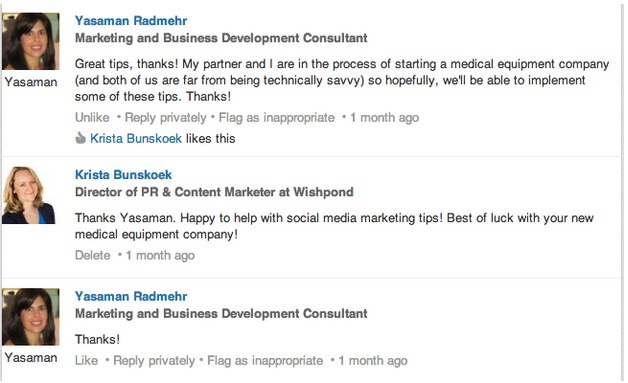 Last, but far from least, make sure you have a LinkedIn share button on your blog posts. Share buttons makes is easy for your readers to share posts with their own network, too. People who are interested enough to share your articles likely have a LinkedIn network who will be interested in your articles too. Additionally, the LinkedIn share button makes it easy to share your article to groups , all in one go. Important: If you use buttons as the way you post your own articles, make sure you’re checking in to LinkedIn throughout the day , to respond to comments and questions about your links. 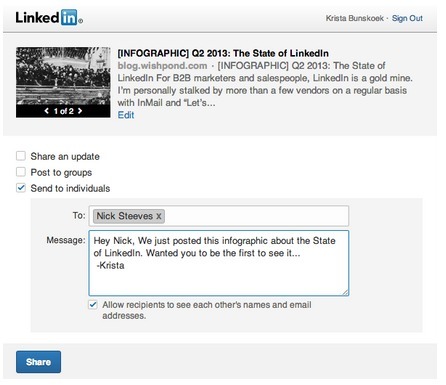 You can use the share button to send direct LinkedIn mail too. Like most blogs, over here at Wishpond, we have LinkedIn share buttons. It makes it easy for our readers to share articles with their LinkedIn network. 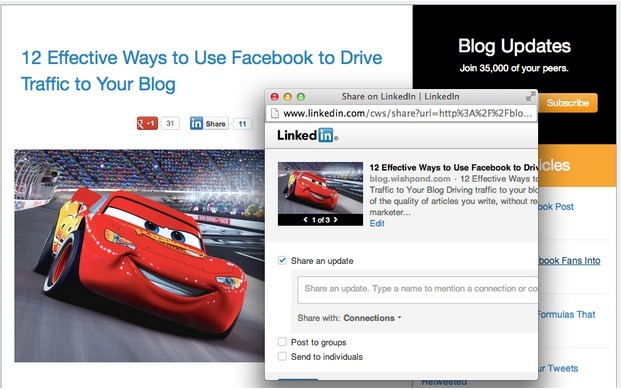 Make sure you have a LinkedIn share button on all of your blog articles. Use the button to share your links with your groups - but just make sure you check your updates directly on LinkedIn too! Use sidebar buttons on your blog posts to generate even more shares. Business professionals use LinkedIn. Network on the site by making the right impression, engaging with your connections, joining and taking part in niche groups, and sharing pertinent information. Apply these ten networking tips to increase your business blog traffic. Improve your LinkedIn investment pay off. What do you think? Do you use LinkedIn to network? Do you use it to increase your blog traffic? What’s worked for you?